Facilitating a Profitable and Sustainable Grains Industry in the Esperance Port Zone. Keeping You Up to Date with What Barley, Wheat & Canola Varieties are Best Suited to Your Area. SEPWA Research Projects Actively Explore New Developments That Will Help You Make More Informed Decisions. Encouraging Growth for Sustainable Futures. 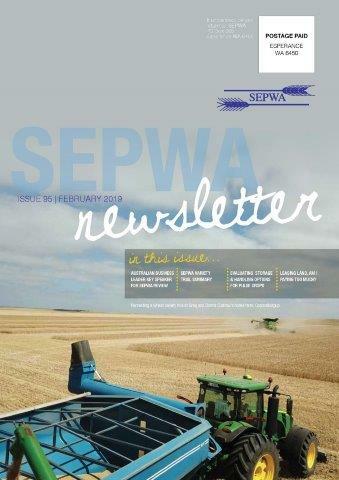 The SEPWA Membership Represents Some of the Most Progressive Grower Groups within Western Australia. SEPWA was established in 1993 to represent wheat growers in the Esperance Port Zone, assisting growers to produce premium quality grain. Today, SEPWA's vision is to improve profitability and sustainability of Esperance Port Zone grain growers. Results from the 2018 SEPWA Variety Trials are being uploaded. Keep up to date with what varieties are best suited to your area. This scholarship is to raise the awareness of depression in rural Australia and support capacity building in the agricultural industry. Thanks to funding from Department of Primary Industries and Regional Development, Esperance Shire and Goldfields- Esperance Regional Development SEPWA implemented a 90-day trial of a private date network. With in-kind support from Cascade Grains and CBH, 2 mobile phone network style base stations will be installed on the elevator towers at Cascade Grains and Lort River CBH.